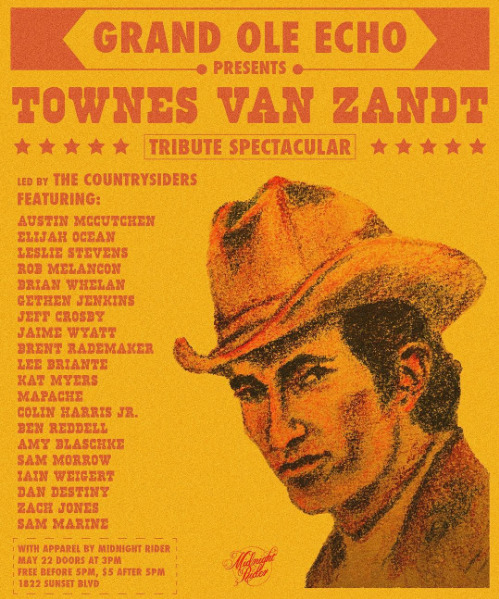 “Grand Echo Presents a tribute to Townes Van Zandt, a man whose influence has spanned genres and generations. We’ll be featuring an amazing cast of LA’s country scene. Our friends at Midnight Rider coming to sell their amazing TVZ merch as well. The night will be led by the ever amazing Countrysiders. We’re excited to be presenting this celebration of an amzing man and a true musical pioneer.